Noah Green is a young girl whose parents won't allow her to have a dog. When she finds what she thinks is a guinea pig under a baseball cap in a box at a garage sale, her parents agree to let her bring him home. It quickly becomes clear that Cappy, as Noah names the mysterious pet, is not like most guinea pigs, but it isn't until Noah takes a class trip to the zoo that she realizes the truth about her new furry friend. Though I have to admit that this book doesn't really tell a new story, it is a solid beginning chapter book. I read it with my five-year-old, and she found the story engaging, and my three-year-old also enjoyed stealing the book from us to look at the illustrations. Because I was sharing the book with such young readers, I appreciated the fact that Noah is a straightforward and honest character. Often in books where parents have forbidden pet ownership, there is an element of dishonesty involved in trying to change their minds, but in this case, that doesn't happen. This does eliminate some opportunities for conflict (of which there is little in the story in general), but it also makes Noah a good role model. My copy of the book was a pre-publication review copy, so I tried not to be nitpicky about the typos I found, but I have a pet peeve about the phrase "sneak peak" (which is not the same as "sneak peek") so seeing that in the section introducing the next book had a bit of a "nails on the chalkboard" effect on me. I also found myself getting distracted by the fact that the word "okay" was written as "Ok." I think it would have bothered me less if the two letters had both been capitalized. These are minor issues (and I'm hoping they were corrected before the book was published) but my English major brain just couldn't completely ignore them. The Noah Green: Junior Zookeeper series seems like it would be a great read-alike for the Shelter Pet Squad series by Cynthia Lord, and for the Lulu series by Hilary McKay. Kids who don't have pets and wish they did, as well as kids who have pets and enjoy animal stories will find something to appeal to them in this book, and they will be excited to see where Noah's animal adventures lead in future installments. 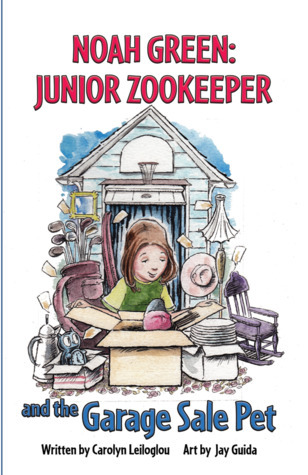 Sign into Goodreads to see if any of your friends have read Noah Green Junior Zookeeper and the Garage Sale Pet.